Great couple of days at this super property Weather was excellent and we enjoyed great walks in the area. The hot tub was a wonderful addition to the property. Great place to relax and enjoy the views after a days walk The Pavilion is well kitted out. We loved the walk in shower room and four poster bed. Sadly it was too warm to light the log burner ! We had a brilliant stay at the Pavillion. Julie was fantastic at quickly responding to the queries we had (and was incredibly kind when I notified her we had an accident with a vase!). The property had virtually everything you could need and was very comfortable. The kitchen was particularly well stocked for a holiday let. The welcome hamper was lovely. The information pack on the area was also fantastic in planning our stay. We loved the hot tub! We stayed at the pavilion about 4 years ago and there are signs of some wear and tear, to be expected, but some small things would help to reduce this e.g replacing the protective glove for the fire (has lots of holes in it! ), making sure there are usable tennis balls for the tennis court and fixing the door separating the bedroom from the lounge so that it will close. The code to get into the tennis court was also out of date in the information pack, but Julie got back to us instantaneously with this when we asked for it, which was very much appreciated. There were some issues with cleanliness e.g the toilet roll holder was really quite dirty and the light fixings needed cleaning in the bathroom and we needed to clean quite a few of the glasses before we used them. These are all small things but you do pay a premium for quite a small space, especially at peak times, so you expect everything to be perfect. Overall we had a wonderful stay- thank you! We hope to be back again soon! We stayed at The Pavilion for our mini moon It is the most fantastic property with amazing hot tub and four poster bed. The walk in wet room was perfect and every detail had been considered. The Pavilion is so gorgeous , we wanted to stay in all the time but we did venture out to the Lunesdale Arms in the village and had an excellent meal there. We would highly recommend this property. My partner and I stayed here for 3 nights and did not want to leave! The Pavillion is well furnished and the kitchen is well equipped with everything needed to self-cater. The hot tub was definitely a hit with us, and relaxing in it afer dark under the canopy as the rain fell around us was a lovely experience. The Sonos sound system was a nice touch, and downloading the app so we could play music in both the living room and the bedroom was a simple process. The waterfall shower was slightly disappointing as the low water pressure meant it wasn't as effective as it could have been, but this did not detract from the overall experience. Other nice touches were the welcome basket containing tea and coffeem with milk and the fridge and a very delicious lemon drizzle cake! There are also plenty of guides to local attractiosn such as the Ingleton Waterfalls Trail. We absolutely loved our time here, and we wil definitely be back at some point! We had a fantastic weekend, great location, good pubs, walks and the pavilion was very comfortable with added bonus to relax in the hot tub. Excellently presented cabin with all mod-cons and in a secluded spot. Great location to Lakes etc. Booked 5 days away here for our honey moon and loved the place. Great location, lovely and cosy place especially once the log burning fire is lit. Hot tub provided a relaxing way to unwind after a day of exploring the lakes and surrounding areas. Local pub Lunesdale Arms is outstanding! As is The Highwayman in the next village along. The Pavilion is the perfect place to spend quality time with your significant other: it’s cosy, romantic and in a beautiful, quiet location. The facilities are great with a Sonos sound system, well thought out kitchen, amazing rainfall shower, extremely comfortable bed and a hot tub built for 2 just outside the bedroom on the veranda. There is a pub less than 5 minutes walk away, the town of Kirkby Lonsdale is about 3 miles away, and if you don’t want to drive the bus stop is outside the pub! I certainly hope to return to this fantastic property. Excellent unique spot to get away from the hussle and bussle. High standard throughout and excellent communication throughout. Would highly recommend. My partner and I enjoyed a wonderful stay at the Pavillion. The views are spectacular and the hot tub is the perfect place to enjoy them from! The Pavillion itself is sleek and modern with some lovely touches (our favourite was the heated mirror in the shower) throughout and was extremely clean on arrival. There are plenty of amenities; coffee maker, kettle, toaster, cooker, oven, washer, dishwasher, two smart tv’s, a music system throughout and many more! We definitely recommend travelling with your own car or transport as most of the activities in the area are around an hours drive. However, we enjoyed excellent hospitality at the Lunesdale Arms in the evenings which is right around the corner. Overall, we had a lovely stay at the Pavillion and would absolutely recommend this to anyone, we hope to return soon!! Excellent Break at a lovely place set within a beautiful location. The Pavilion is A1 all round, the set up, log burner, hot tub, under floor heating, the kitchen, etc. there’s been no expense spared when putting this place together, it’s outstanding throughout. Locally there are some very nice pubs and the surrounding areas give you plenty to do and see. Would certainly recommend and we’ll be returning in the future. Top spot for break away, views are lovely and the patio windows in the bedroom lets you see the sunrise in the morning without having to go outside. The Pavillion itself has everything required for those who wish to self cater or just use it as a base. It was very clean and tidy and had a lovely atmosphere. The hot tub perfect for winding down and just relaxing even when its raining. Hosts Julie and Steve very helpful. Would gladly book again. The Pavilion was such a nice place to stay. It is within short distance to both the Lake District and Yorkshire Dale. We stayed there fore 3 nights over Easter holiday, on the sunny Friday, we took a 30min drive to reach Lake Windermere, and spent a lovely half day there. On the less sunny day, we drove the other way to Yorkshire Dale, and saw the magnificent Ribblehead Viaduct within 1 hour drive. Apart from the great location, we also enjoyed the hot tub a lot. It was a perfect treat to yourself after some walking or rowing on the lake, or tennis playing in the nearby tennis court. Overall, we enjoyed the stay a lot. I would definitely recommend it for a perfect couple trip. Excellent stay, would very much recommend! A lovely property - it looks exactly as it does on the pictures - in a great location. We had a very relaxing stay. If you can bear to leave the Pavilion, there are plenty of excellent pubs and restaurants in the vicinity as well as great walks and views. The property is very well done out with all mod cons, including good quality pans, knives etc. which do make a difference. It's a private spot, but with great views across the fields to Ingleborough. We cannot recommend it highly enough and would love to stay again. We had a lovely stay at The Pavilion. Julie & Stephen (along with Sarah) can't be recommended enough and provided a lovely, well equipped property along with lots of useful information on the location & surrounding areas. Lying in the hot-tub on a freezing December night looking up at the stars (with a bottle of fizz...) was a real treat and my partner loved it too. We would definitely use Mill House Cottages in future. A special cottage for a special occasion - a honeymoon! This cottage was booked as a wedding present and it fulfilled all our hopes as a high quality, relaxing retreat following the wedding. They loved it and commented particularly on the amazing hot tub which maintained its temperature throughout. Thank you for making their wedding memories even more special. We booked at late notice for a short honeymoon break and are glad we did. Customer service was faultless throughout and the pavilion was clean as a whistle. We absolutely loved the hot tub watching the scenery and the mod cons the accommodation had finished it off nicely. We will be back! We both enjoyed our stay, The Pavillion is a lovely place in a great location. We feel it was over priced for a 3 night stay but would look to stay again in another property of Mill House Cottages. We stayed at the Pavilion in October 2017 and it was fantastic. Ideal for the two of us and in a great location, nearest town is Kirkby Lonsdale. This really is a beautiful part of the country with some fabulous places to eat in the surrounding area. The communication with Stephen and Julie was good. A welcome text message with contact details, and in the cottage all the information we needed for the surrounding area. The little hamper that they left was great, a loaf of bread and jam, butter and milk in the fridge and a much needed bottle of wine! There was also tea and coffee supplies! The trip was for our honeymoon and was the tranquil relaxing place that we needed. We sincerely hope to be back, if not to the Pavilion, but to one of the other cottages. My wife and I had a superb little minimoon away at The Pavilion. The accommodation was just right. It is finished to a very high standard with a real attention to detail paid on everything in the property. Comfortable bed, superb shower, beautiful hot tub and cosy couch. (There's even a log burner! - which we didn't need to use as it was warm enough). I'd highly recommend this for breaks away and as a base for hiking or exploring both the Lake District and Yorkshire Dales. We stayed at The Pavilion for our wedding anniversary and it didn't disappoint. The accommodation is finished to a very high standard. The hot tub is a real treat. It's a shame we had a couple of rainy days which meant not being able to make full use of the outside space on offer. Kirkby Lonsdale is a lovely town with plenty of places to eat and drink and it even has it's own brewery for those ale lovers like me. We would definitely return. The Pavilion looked as stunning and stylish when we arrived as it does on the website. The "Welcome Hamper" was a lovely surprise. We enjoyed playing with all the modern features such as the electric blinds, remote controlled lights, Nespresso machine etc. We made the most of having the hot tub, a feature that makes this cottage all the more special. The location is great and makes an excellent base for walks in the area. We were very lucky with the weather and made the most of it with a drink in the beer garden at The Highwayman pub just a short walk across the fields in Burrow. Great customer service including welcome messages and a handy information pack. Would definitely book again. Lovely stay, relaxing and luxurious. The pavilion was beautifully decorated and things like underfloor heating and electric blinds set it apart from other cottages. The location was great, only a 5 min drive to Kirby Lonsdale. We did 2 walks from the pavilion, one across fields to the Highwayman pub (great food), and one circular walk (4 miles). OS map provided. Hot tub was lovely and great to relax in after a walk in the cold winter weather. We didn't get chance to use the wood burner, as the underfloor heating kept us a bit too toasty! Lovely little place to stay. Would definitely recommend. Clean and comfortable, nice welcome hamper, good local pubs and peaceful area. Superb location and the property was extremely comfortable with great finishing touches. The property was also accessible for my wife's wheelchair. A beautiful cottage in a wonderful location which was exactly las shown in the pictures. The location allowed us to easily drive into both the lakes and the dales and there is a pub in walking distance which is perfect for when you don't want to cook. The cottage itself was lovely and very high tech. We particularly enjoyed the heated floors in the bathroom and the smart TV so we could use our personal logins for Amazon/Netflix although we noticed DVDs were also provided. Our only minor niggle was the blinds. Aesthetically they were lovely but practically the blinds in the bedroom were very light and so did not block the sun (we were very lucky with the weather!). You also had to close all the blinds in the lounge every night as the door from the bedroom to the lounge is glass. We are early birds anyway so it really wasn't a big deal but for those that need darkness to sleep once the sun is up this may prove problematic. However, as i said only a minor issue and did not detract from the lovely time we had. Beautiful property in a quiet village location. Had a wonderful stay and would definitely go back. Hot tub is a nice added touch to be stay. Very relaxing and good pubs / walks etc nearby. We stayed for a week at The Pavilion and had a fantastic time. The welcome pack was a lovely surprise, fresh bread, homemade jam, wine and many more little extras. The Pavilion is beautifully decorated throughout and has everything you need for your stay. Lovely walks nearby and use of the tennis court which we used several times during our stay. The hot tub was fantastic after long walks with a glass or two at the side !! I would definitely recommend The Pavilion for a relaxing week away. Had a really good time with my wife for my 30th birthday. The owners even said we could bring our dog although it said no pets which was excellent. Lots of places to go/hot tub was excellent/views were good/everything was there at the pavillion. Well presented cottage. Would definitely book again and recommend to friends. Lovely break despite the weather! The Pavilion was presented beautifully on our arrival - warm and cosy with the lights on and a thoughtful become pack. Spotlessly clean and we loved the decor. Easy, comfortable living for a week or so with some great touches such as that superb rain shower with almost instantaneous hot water, the part of the shower-room mirror that doesn't mist over, and the Sonos music system. The hot tub was a revelation for us and so relaxing after long walks in the hail and snow! Don't know if it was the walks or the hot tub that got us sleeping so well in that lovely bed. Waking to the ever-changing landscape views and dramatic skies with Ingleborough as the focus. Thoroughly recommended and we'll certainly be looking at other locations with Mill House Cottages. Many thanks to Steve and Julie. A luxury escape away from it all! We managed to escape without the kids ! A much needed break and after a long journey on the M6 what a treat when we opened the door ! Luxury! Beautifully finished a welcome pack including a bottle of wine! The hot tub was a real treat after a long walk in the beautiful lakes. There wasn't enough hangars for someone who packs to much . Nothing was to much trouble and the following day we had some delivered. We would definatly return and real luxury escape away from it all! Thank you so much for your fantastic review ! We are delighted that The Pavilion proved to be a wonderful escape for you ! PS - glad it's not just me who overpacks ….. ! This was our second stay at The Pavilion. Had a fantastic break , lovely location, very comfortable and lots of gadgets and high tech mod cons ! We will be back !!! Stayed here for a 4 night break in January. Accommodation is exactly as shown on website. Genuine 5-star property with everything you could possibly need including a lovely welcome pack on arrival. Ideal for a romantic break away. Also has the local pub in Tunstall just a 3 minute walk away. Would recommend highly. Lovely little place to get away for a few days! When we arrived at the pavilion we were greeted by a beautiful lit up path and the directions on the info pack were very clear. Our welcome hamper was thoroughly appreciated including essentials and other little items from the local independent supermarket. The location was stunning especially when sat in the hot tub admiring the view in the morning! The place was full of mod cons, our personal favourite being the electric blinds in the bedroom! One of our only issues was struggling to get the DVD player to work and due to not being able to alter the heating if got very warm on an evening! Overall a lovely stay and we would definitely consider coming back! Stayed for four nights in December. The Pavilion is well furnished and kitted out in a fun & quirky way and provided everything we needed for a relaxing short break. We really enjoyed using the hot tub after long walks. The location is good, in walking distance of a couple of good pubs and, despite being close to other properties, very quiet and peaceful. Yes the doors to the bedroom don’t fit properly but it wasn’t really an issue. The welcome pack was a nice touch as was the visit from Julie to check that we had everything we needed. Well I wish it could be Christmas everyday! Perfect for some quality time together. There is no doubt that Julie and Stephen have done up the Pavilion to the highest standard possible. It's beautiful, immaculate and everything in the building is of the highest quality. Some of the electrics are a little bit complicated as they are so incredibly high tech and the building is so well insulated it gets really, REALLY warm!! The hot tub is a lovely touch (especially if you go out walking, get a bit lost because of the floods and end up climbing over hedges in the dark to get home!!). We had a lovely stay - thank you both. Booked for a birthday treat for my husband. I could not fault the property the interior was beatiiful and very well maintained. The hot was amazing and made our stay seem extra special. The lovely touch of the welcome hamper was fab. Would definitely stay again. We booked the Pavillion for a week to relax after our wedding. The Pavillion is furnished to a very high standard and all the fittings and appliances work great. The hot tub was clean and heated ready for us to arrive. We had a fantastic week relaxing without any disturbances. Even the local food was great in the Lunesdale and the Highwayman (particularly good!). The only thing we noticed that was wrong was that the door between the bedroom and living room didn't close but this wasn't really an issue as it was on the two of us anyway. Well worth a visit and would go again - thanks for a wonderful break! We were surprised that for such a well equipped kitchen there was no microwave (unless it was well hidden away). Apart from that The Pavillion was ideal for a quiet weekend away and we thoroughly enjoyed our stay. A classic little romantic hide-away, quiet, yet convieniently located for all you would require during your stay, and after either a refreshing day on the fells, or a browsing the great selection of cafes, shops and restaurants in Kirkby Longsdale there is the hot tub with gorgeous views to help sooth those aching muscles and to help un-wind from a grand day out. We had a great stay, the hot tub and log fire were a real bonus to the property. Everything was to a very high standard and we really appreciated the extra touches of dressing gowns and slippers. This was an ideal place to relax and unwind. The area is close to a lot of walks, some direct from the door. the Lunesdale Arms is the local pub and serves excellent food, there is another pub the Highway Man that can be reached by walking across a couple of fields, this also served nice food. A dip in the hot tub at the end of the day was very relaxing. This property is simply charming. The booking was easy, the owners were very accommodating an helpful. We had a wonderful stay. The pavilion is extremely well laid out and is all top quality fixtures and fittings. The bed is comfortable and the hot tub is powerful and warm. We enjoyed local walks and it was the perfect base to spend quality time with someone special. Just One Word to describe this property - FANTASTIC! Had a wonderful stay. Thank you so much . The Pavilion is everything and more than we hoped for. Can't wait to come back for our second anniversary!! Perfect place to get away from it all with added luxury! Myself and my partner decided we wanted to head towards the Lake District and the Dales to celebrate our anniversary and found the Pavilion as the ideal location for our long weekend away in January. We contacted the owners who own a number of properties in the area but recommended the Pavilion for a couple. We arrived and was amazed by the lovely decor which came with a load of excellent features such as the Sonos sound system, latest TV entertainment system and heated floors as well as all of the tools to self cater for a whole weekend. As the property was rural, the broadband was not the greatest but it in all honesty it was great to disconnect from it all and just relax with a boxset or two! The owners (especially Julie) were excellent with communication, and definitely not intrusive. Would recommend it to any couples who are looking to really to relax in luxury added but not the added costs that come with it! 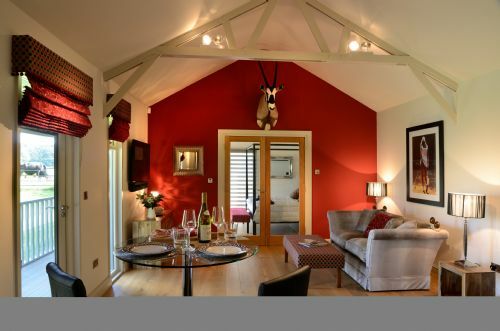 The Pavillion has everything you might need, modern but stylish set in beautiful countryside. The hot tub has wonderful views and the welcome pack on arrival is so thoughtful. We couldn't fault a thing and will return! This is without doubt, the best self catering property we have ever stayed in. Attention to detail is superb . Stephen and Julie have thought of everything. We will definitely be back. The pavilion is the best apartment we have experienced. Location is quiet yet within walking distance of great places to eat. Clean, comfortable and stylish. what more is ther to say. My wife and I were looking for somewhere to get away from work; to get into the fresh air; and to relax and spoil ourselves for a week. The Pavilion provided all of these. It is beautifully laid out, kitted out and decorated. We felt entirely secure and secluded even though we looked out across open fields. There was a welcome hamper of lovely things and some bathrobes and slippers to aid the daily chilling out in the hot tub. The Pavilion looks east to the Yorkshire Dales, where we found ourselves on most days, but equally easy was a trip into the Lakes to the west. Kirkby Lonsdale a few miles to the north provides any provisions, but I'll be honest when I say that most nights we ambled the 200 yards to the Lunesdale Arms for excellent evening meals. Perfect place to relax and unwind. Wonderful surroundings and amazing comfort and finishing touches. Will definitely be paying another visit. Thank you. We had a fabulous stay at the pavilion it's a unique place, lovely walks and waterfalls nearby. Nice and quiet with a local country pub close we loved it . The Pavilion was a lovely 'cottage' to stay in. There are many luxury touches including a generous welcome hamper. The outside verandah and decking with its beautiful view of fields and Ingleborough added greatly to the holiday. The hot tub was an added bonus. Having a deep, warm soak under the stars was very relaxing and romantic. The village pub which is in walking distance is attractively decorated with good food too. Tunstall is equally placed between the Lakes, the Yorkshire Dales and the Forest of Bowland and it is an ideal base for exploring these beautiful areas. Really lovely conversion that has been tastefully done with outstanding views and a nice pub 5 mins walk from the door. I cannot recommend this highly enough.